Nineteenth century phrenology followers referred to a two-dimensional map outlining the sections of the human head that drew correlations between the shape of one’s skull and specific mental faculties. This diagram of the head as well as the basic theory of phrenology—“reading” the surface of the head to determine personality, morality or character—is what inspired the aesthetic and concept of this series. 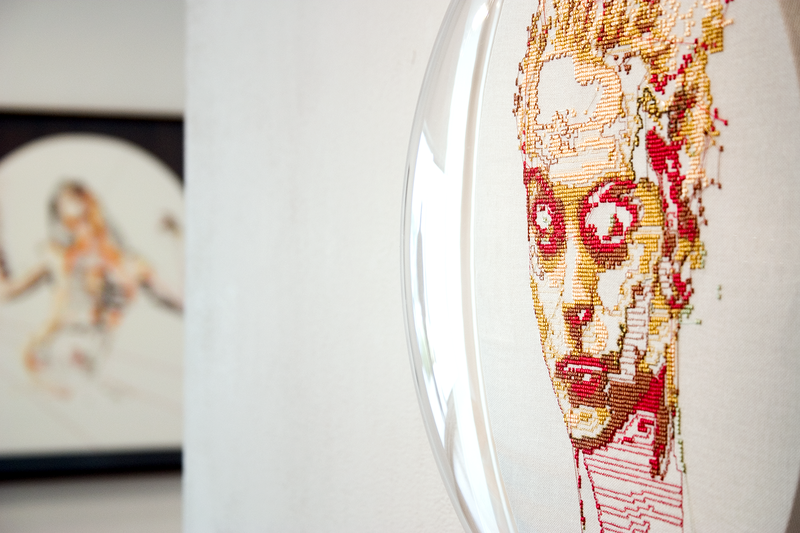 Photographs are appropriated from online news sources depicting various celebrity women and digitally translated into cross-stitched head studies. This process of remediation and abstraction creates a cyborg-esque representation, and comments on the public dissection of female roles by the media and society at large. The juxtaposition of such media-made celebrities blurs the distinction between praiseworthy figures and unworthy role model. 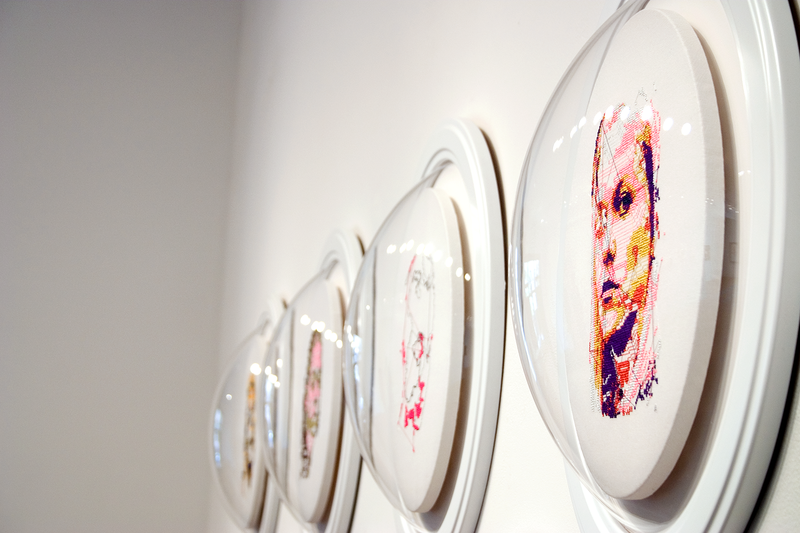 The women depicted in the Phrenology Studies series raise questions about motherhood, fertility and morality as well as the portrayal of their stories by the media. One image in the series depicts the image of Casey Anthony, coined “Tot Mom” by the media, who stood trial for the brutal murder of her three-year-old daughter, while the image of Nadya Suleman or “Octomom” is accompanied by the digitized likenesses of her eight newborns, made possible by modern advances in in vitro fertilization. “Tot Mom” and “Octomom” stare at one another as polar maternal opposites who receive equally obsessive attention by popular culture. With reference to historical ties between photography and science, the tendency to associate physical appearance with individual personality, and the abstraction from digital photograph to embroidery, the Phrenology Studies point to traditional expectations and modern-day characteristics ascribed to motherhood, womanhood and celebrity.